Bring It On was released in theaters in the North America on August 25, 2000. Bring It On earned a worldwide gross of approximately $90 million. Since its release, the film has become a cult classic. Torrance Shipman is a senior at Rancho Carne High School in San Diego. Her boyfriend, Aaron, has gone to college, and her cheerleading squad, the Toros, is aiming for a sixth consecutive national title. Torrance is elected to replace the team captain, "Big Red" who is now graduated. Soon, however, teammate Carver is injured and can no longer compete with her broken leg. Torrance holds an audition for Carver's replacement and gains Missy Pantone, a gymnast who recently transferred from Los Angeles to the school for senior year with her twin brother Cliff, with whom Torrance develops a flirtatious friendship. While watching the Toros practice, Missy recognizes their routines from a rival squad that her previous high school used to compete against. After accusing Torrance of being a liar and stealing the routine, she learns from Torrance's offended and passionately defensive reaction that she was completely unaware. So Missy drives Torrance to her hometown of Los Angeles, where they watch an African American and Latino/Hispanic team, the East Compton Clovers, perform routines that are virtually identical to their own team's. Isis, the Clovers' team captain, angrily confronts the two. Torrance learns that "Big Red" regularly attended the Clovers' practices to videotape and steal their routines. On the ride home, Torrance confesses to Missy that she believes she's cursed after having been dared to drop the Spirit Stick at cheer camp by Big Red and the rest of the departing seniors. Isis informs Torrance of her plans to defeat the Toros at the regional and national championships, which the team has never attended due to their economic hardship. When Torrance tells the Toros about the routines, the team still votes in favor of using the current routine to win; Torrance reluctantly agrees. At the Toros' next home game, Isis and her teammates show up and perform the Toros' routine in front of the whole school, humiliating them. The Toros realize that they have no choice but to learn a different routine. In desperation, they employ a professional choreographer named Sparky Polastri to provide one, as suggested by Aaron. But at the Regionals, the team scheduled immediately ahead of the Toros performs the exact routine they had been practicing. The Toros have no choice but to perform the very same routine. After the debacle that ensues, Torrance speaks to a competition official and is told Polastri provided the routine to several other teams in California. As the defending champions, the Toros are nevertheless granted their place in Nationals, but Torrance is warned that a new routine will be expected. Torrance, crushed by her failure to lead the team successfully, considers quitting. Cliff encourages and supports her, intensifying their growing attraction. Aaron, however, suggests that she is not leadership material and recommends that she step down from her position, selling her out in the process to Courtney and Whitney who have set themselves up as Torrance's rivals. When Cliff sees Torrance and Aaron together, he angrily severs his friendship with Torrance, to her distress. But her confidence is renewed by Cliff's encouragement and she convinces her unhappy team to create an innovative, new routine instead. She breaks up with Aaron, realizing his infidelity and his inability to be supportive, but Cliff still refuses to forgive her. Meanwhile, the Clovers are initially unable to compete at Nationals due to financial problems. This prompts Torrance to get her dad's company to sponsor the Clovers, but Isis rejects the money and gets her team to Nationals by appealing to a talk show host who grew up in their area. In the finals, the Toros place second, while the Clovers win. However, at the end of the movie, Torrance and Isis find respect in each other. Cliff and Torrance share a romantic kiss. Bloopers run alongside the end credits, as the characters dance and lip-sync to B*Witched's cover of "Mickey". Lindsay Sloane as "Big Red"
Peyton Reed cameos as a mime. Bring It On was produced by Marc Abraham and Thomas Bliss. It was the debut film of director Peyton Reed. His major concern with the film was pushing the sexual aspects of cheerleading without losing a PG-13 rating. Roger Ebert from the Chicago Sun-Times argued that this agenda followed a trend of films at the time that watered down material in order to avoid an R rating and increase box office gross. Prior to auditioning for the film, actors were expected to have a cheer prepared. In order to avoid the use of stunt doubles, Reed required all the actors to undergo a four-week cheerleading camp. Reed and Gabrielle Union met numerous times to discuss the best way to approach her character. "I think she was able to find what was cool about that character that in a way I doubt other actresses could have," Reed explained in an interview, "Whenever she's on the screen she has this charisma." When editing the film, Reed and editor Larry Bock watched cheerleading exploitation films from the 1970s. Bring It On was released in North America on August 25, 2000. The film grossed $17,362,105 in 2,380 theaters during its opening weekend, ranking first at the North American box office. Although it experienced an 18% decline in gross earnings, the film held the top position for a second consecutive week, and later on a third. The film went on to gross $68,379,000 in North America and an additional $22,070,929 overseas for a total gross of $90,449,929. Many critics felt the film displays Dunst's range as an actor. The film received a 63% approval rating on Rotten Tomatoes based on 117 reviews, with an average rating of 5.97/10. The site's consensus reads: "Despite the formulaic, fluffy storyline, this movie is surprisingly fun to watch, mostly due to its high energy and how it humorously spoofs cheerleading instead of taking itself too seriously." In comparison, Metacritic, which assigns a normalized rating out of 100 to reviews from mainstream critics, gave the film an average score of 52 based on 31 reviews, indicating "Mixed or average reviews". A. O. Scott from The New York Times commended the film for being able to "gesture toward serious matters of race and economic inequality", as well as for its "occasional snarl of genuine satire". Kevin Thomas of The Los Angeles Times also favored the film, calling it a "Smart and sassy high school movie that's fun for all ages." Steven Rae from The Philadelphia Inquirer found it to be a "likable, low-budget high school comedy". Meanwhile, Kim Morgan of The Oregonian dubbed it the "newest, and probably first, true cheerleading movie." However, some reviewers criticized the plot of the film. Although David Sterritt of The Christian Science Monitor gave praise for the writing, he likened the storyline's simplicity to that of "the average football cheer". Kim Edwards from the Chicago Tribune, in a negative review, found the film "Absurdly unrealistic at times." The Seattle Post-Intelligencer's Paula Nechak concluded that the film was "predictable and surprisingly confusing in its ultimate message. " 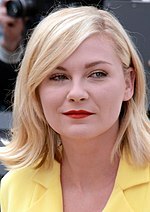 Many critics reserved praise for Kirsten Dunst's performance. In his review, A. O. Scott called her "a terrific comic actress, largely because of her great expressive range, and the nimbleness with which she can shift from anxiety to aggression to genuine hurt." Charles Taylor of Salon noted that "among contemporary teenage actresses, Dunst has become the sunniest imaginable parodist." Jessica Winter from The Village Voice shared this sentiment, commenting that "[Dunst] provides the only major element of Bring It On that plays as tweaking parody rather than slick, strident, body-slam churlishness." Peter Stack of the San Francisco Chronicle, despite giving the film an unfavorable review, commended Dunst for her willingness "to be as silly and cloyingly agreeable as it takes to get through a slapdash film." Cultural historian Maud Lavin says that despite Bring It On's predictable plot, its depiction of aggressive and competitive women, the differences shown between class and race, and the playful way it deals with homophobia gives it deeper cultural clout and meaning. In particular, Lavin says that the film suggests race relations could be "smoothed and transcended through level-playing-field sports competitiveness." The film ranked #30 on Entertainment Weekly's list of the 50 Best High School Movies. Initially unimpressed with the film and giving it 2 of 4 stars, Roger Ebert later referred to it as the "Citizen Kane of cheerleader movies." Several of cast members from the Bring It On film franchise have gone on to greater fame or notoriety. Kirsten Dunst, Eliza Dushku, Gabrielle Union, Jesse Bradford, Clare Kramer, Lindsay Sloane, and several others from the original film were already notable entertainers and television actors or have grown into such roles since their participation in the original film. Ryan Drummond voiced Sonic the Hedgehog from 1999 through 2004. Felicia Day, who appeared in Bring It On Again, became a highly respected actress in Joss Whedon's projects such as Dollhouse and Dr. Horrible's Sing-Along Blog, as well as a screenwriter (The Guild), entrepreneur and web content creator. Bree Turner, who starred in Bring It On Again, would go on to star in NBC's Grimm. Joshua Gomez, also from Bring It On Again, was going to be well known as Chuck regular Morgan Grimes. Bethany Joy Lenz and Hayden Panettiere, who appeared in Bring It On Again and Bring It On: All or Nothing, went on to find sizable television audiences due to their roles on the television programs One Tree Hill and Heroes/Nashville, respectively. Lenz also appeared with Michael Copon (who co-starred in Bring It On: In It to Win It) during One Tree Hill's second season. Copon also starred in Power Rangers Time Force, Ashley Benson from In It to Win It, became known as Hanna Marin in the Freeform television series Pretty Little Liars and Cassandra Scerbo from In It to Win It, who later known as Nova Clarke in Syfy's Sharknado film series. The R&B/Pop trio Blaque have a recurring role in Bring It On. Noteworthy R&B singer and film actress Christina Milian, also appears as the main character in Bring It On: Fight to the Finish. Brittany Anne Pirtle from Fight to the Finish, went on to star as the Yellow Power Ranger in Nickelodeon's Power Rangers Samurai and Holland Roden from Fight to the Finish, became known as Lydia Martin in the MTV supernatural-drama Teen Wolf. Finally, Cristine Prosperi from Bring It On: Worldwide Cheersmack, played Imogen Moreno in Degrassi: The Next Generation. The only sequel to feature any of the original crew from Bring It On was 2004's Bring It On Again, which shared the film's same producers. These producers did not return for the subsequent sequels, and none of the films share recurring cast members. Original star Eliza Dushku has even been quoted in interviews as never even having been invited to participate in the sequels. Steve Rash directed two of the sequels and Alyson Fouse has written four. Otherwise, none of the films in the Bring It On franchise share any personnel whatsoever. The five films that follow Bring It On share only tenuous links with one another. The plot of each film typically follows that of the one originally laid out in the first film - a competitive cheerleading team who has to change routines or other elements they have grown accustomed to in order to win. A stage version of the film premiered at the Alliance Theatre, Atlanta, Georgia on January 16, 2011. The musical has music by Lin-Manuel Miranda and Tom Kitt, lyrics by Amanda Green, and a book by Jeff Whitty. The director and choreographer is Andy Blankenbuehler, with a cast that includes Amanda LaVergne as Campbell, Adrienne Warren as Danielle, and Nick Blaemire as Randall and "award-winning competitive cheerleaders from across the country". The Alliance Theatre production was nominated for eight Suzi Bass Awards, winning awards for Choreography (Andy Blankenbuehler), Sound Design (Brian Ronan) and World Premiere Play or Musical. Additionally, the production was nominated for ten Atlanta Theater Fan Awards from www.AtlantaTheaterFans.com, more than any other production in 2011. The production won for Best Musical and Best Choreography (Andy Blankenbuehler). A national tour of the musical started at the Ahmanson Theatre, Los Angeles, in November 2011 through December 10, 2011 and then travels to San Francisco, Denver, Houston, and Toronto. The national tour stars Taylor Louderman as Campbell and Jason Gotay as Randall. The cast took part in a special celebration kicking off the national tour of the musical on October 22, 2011, which featured performances from the show. The New York Times reviewer wrote of the Ahmanson Theatre production: "After an opening number that truly dazzles as it reveals the cast’s impressive gymnastic prowess, the score hits its stride only when Campbell transfers to Jackson High. Driven by surging R&B grooves and churning lyrics that suggest the fingerprints of Mr. Miranda ... the dance numbers for the Jackson crowd kick the musical into high gear for most of the first act.... Like most entertainments about the trials and triumphs of the teenage years, 'Bring It On' has as much sap as it does pep in its DNA. It’s distinguished primarily by the electrifying dance routines and the elaborate cheer-squad performances." The musical opened on Broadway at the St. James Theatre, in a limited run, starting on July 12, 2012, in previews, officially on August 1 through December 30, 2012. ^ a b c "Bring It On (2000) - Box Office Mojo". Box Office Mojo. Retrieved 2010-06-10. ^ a b c Rizov, Vadim (July 15, 2010). "The unexpected cult status of Peyton Reed's "Bring It On."". IFC. Retrieved August 11, 2012. ^ Ebert, Roger (August 25, 2000). "Bring It On". Chicago Sun-Times. Retrieved August 11, 2012. ^ a b c d Kleinman, Geoffrey. "Peyton Reed - Director of Bring it On". DVD Talk. Retrieved August 11, 2012. ^ a b "Bring It On: 2000". Box Office Mojo. Retrieved August 11, 2012. ^ a b c d e f g "Bring It On". Metacritic. Retrieved August 11, 2012. ^ a b Scott, A. O. (August 25, 2000). "Bring It On (2000) Film Review; Strong, Modest and Sincere Behind All the Giddy Cheer". The New York Times. Retrieved February 10, 2012. ^ Taylor, Charles (August 25, 2000). ""Bring It On": Two, four, six, eight, who do we appreciate? Spunky cheerleaders rip up the color line". Salon. Retrieved August 11, 2012. ^ Winter, Jessica (August 29, 2000). "Cheer and Loathing". The Village Voice. Retrieved August 11, 2012. ^ Stack, Peter (August 25, 2000). "Navel Maneuvers / Cheerleader comedy `Bring It On' shows its stomachs, not its brains". San Francisco Chronicle. Retrieved August 11, 2012. ^ Lavin, Maud (2010). "Push Comes to Shove: New Images of Aggressive Women", p. 58. The MIT Press, Cambridge. ISBN 978-0-262-12309-9. ^ "50 Best High School Movies". Entertainment Weekly. July 31, 2008. ^ Ebert, Roger (February 18, 2009). "Fired Up". Chicago Sun-Times. Retrieved August 11, 2012. ^ Rohter, Larry (October 27, 2010). "Lin-Manuel Miranda to Close Out Broadway Run of 'In the Heights'- ArtsBeat Blog - NYTimes.com". The New York Times. Retrieved 2010-11-10. "Interview with Peyton Reed about the film". Archived from the original on 2008-02-10. Retrieved 2006-07-27.